Eagleville Soaring Club - GTA Race This Past Weekend at Eagleville! Home/Uncategorized/GTA Race This Past Weekend at Eagleville! 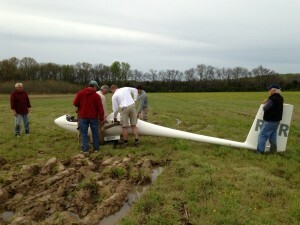 On Saturday, April 13th the Eagleville Soaring Club hosted the GTA Race. The day dawned with faint promise of good soaring that was soon dashed by blue, blue, blue skies. Scott Myers (NX) was the first spotter, launching at noon. The initial reports from the air were not encouraging and soon Scott joined the rest of on the ground. After another hour we send up Jordan Pollock (E) who reported the conditions as marginal but acceptable for the launch. Over the next hour we launched 17 competitors into less than ideal conditions. We knew it was going to be a interesting day when the first calls for retrieval came before the ground crew made it to the clubhouse for a well deserved drink. Corn Field Bob however had the land out that will be discussed for years to come. Bob made a good landing in a really nice field. The only problems was that it was very wet. 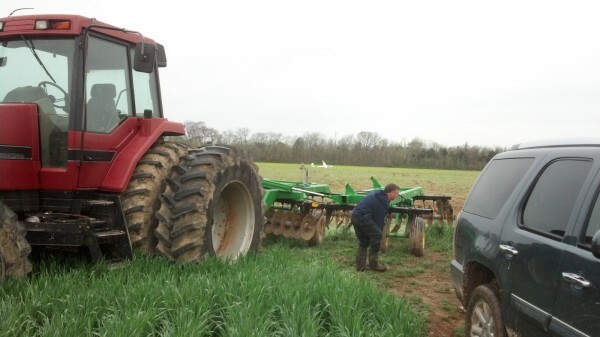 Oh did I mention that it was wet enough to get a tractor stuck. For more on this, click here to read Frank Paynter’s story in Soaring Cafe.